Tuesday was my birthday, not saying how old I am! Let’s just say I’m not a Spring chicken anymore! Not a winter chicken either, but somewhere in between. They say age is just a number and I live by that mantra! I’m enjoying my life more now than at any other time in my life. I haven’t spent much time in the studio this week, we went for a ride on the Sandia Tramway on Tuesday evening and have been sleeping in everyday. It IS my week after all! I have done a bit more painting on my current work in progress. This is a larger canvas than I’ve been painting lately. A friend gave me the canvas and so I figured I may as well put it to good use (Thanks Stephanie!). This one is an 24 x 30″ oil on canvas. (Darn it! I just cut my finger on the tape measure!) It’s getting very close to completion! I’m working on updating my portfolio and this means I have several older paintings to clear out of my studio. Check out my Etsy shop for some really great sale prices on some great art! 😉 I will be adding more paintings in the coming days and weeks. Today I will start my next painting video! I’m working on a series of 12 x 12″ oils on canvas that will be made into a video series. Each painting will be named after a song on our Sunlight CD, Life is Good. The corresponding song will provide the background music for the video as well. I hope you will check back in with my blog, or better yet, subscribe so you can get an email when I post the next video! Last night we made it home from our second trip out in the RV. We went back to Arizona again. 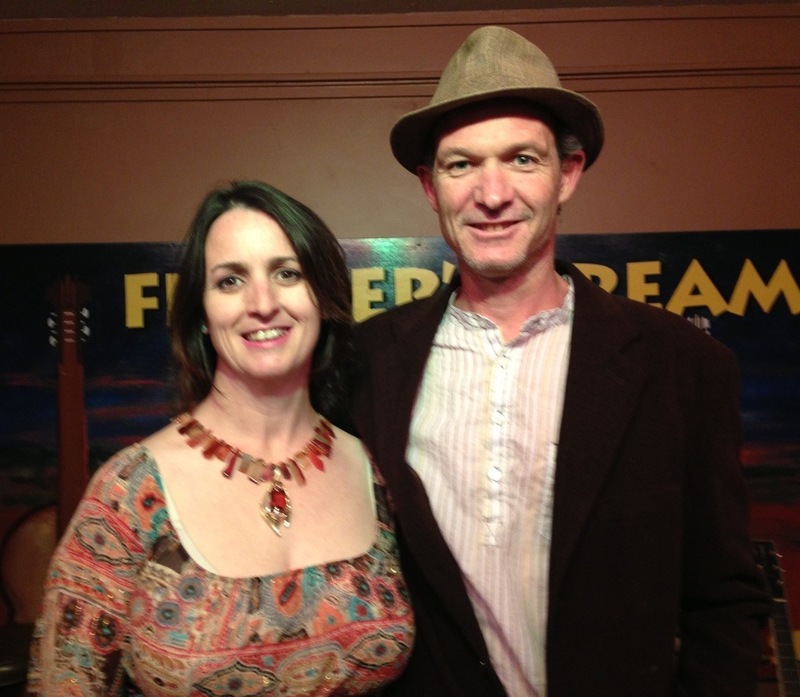 This time starting off in Phoenix where we had a Sunlight show at Fiddler’s Dream coffee house. Then heading to Tucson the next day where we had a gig at Delectables restaurant. 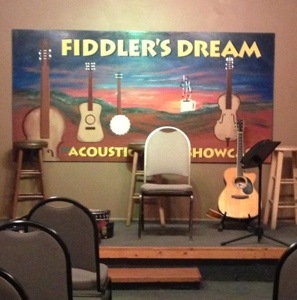 Fiddler’s Dream is just that, a dream venue! The audience is actually listening and not just there to eat and visit with each other. We had a really wonderful response there, it was lovely. 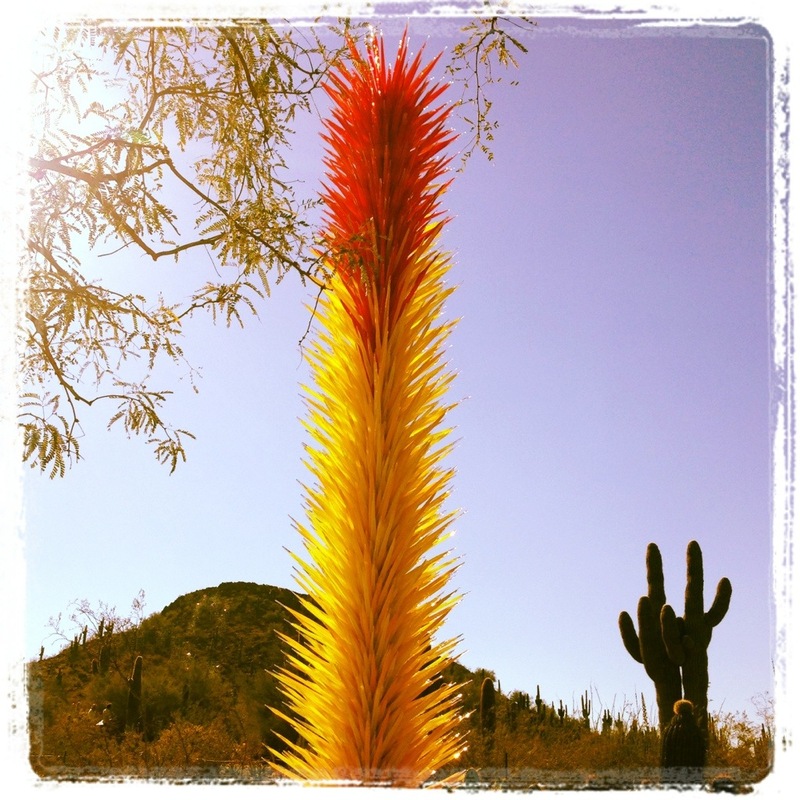 We will definitely go back on our next trip to Phoenix! 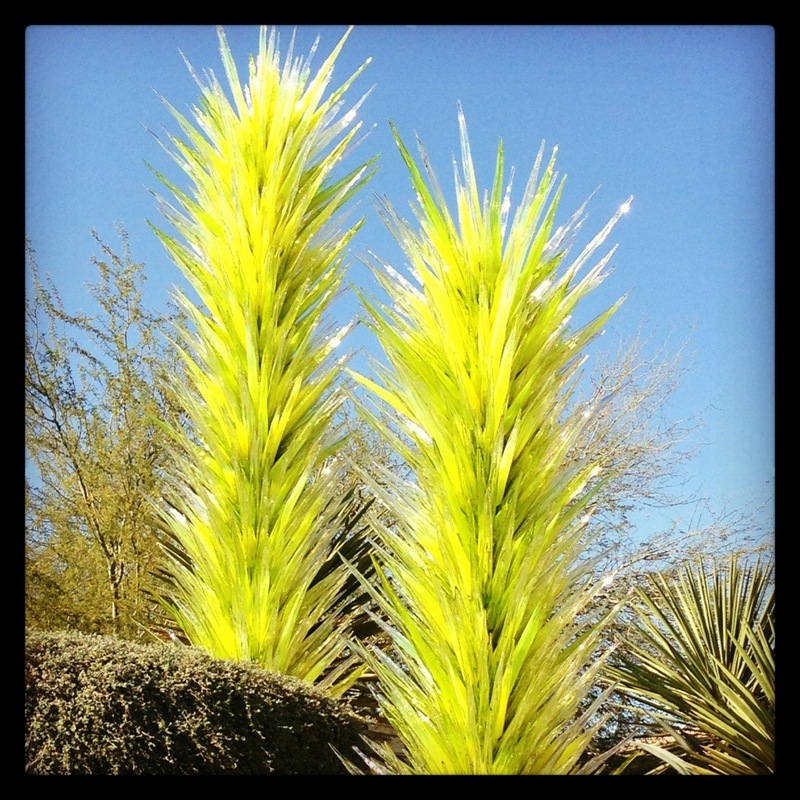 Before we left Phoenix, we spent the late morning/early afternoon at the Phoenix Desert Botanical Gardens. 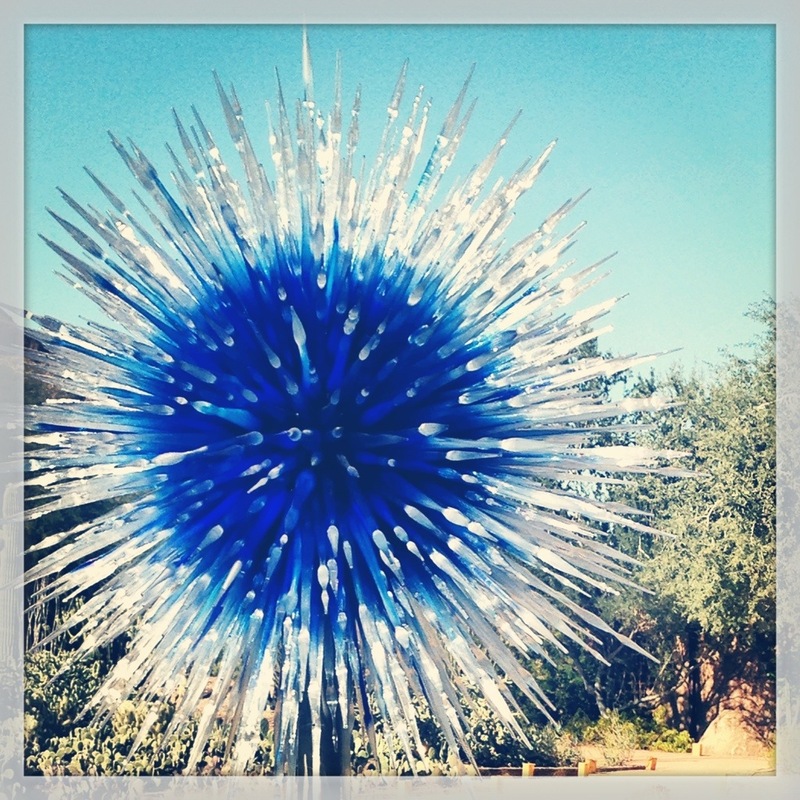 They had an exhibit of Chihuly glass sculptures all throughout the gardens. Though it was a bit chilly, it was a lovely sunny day to be there. 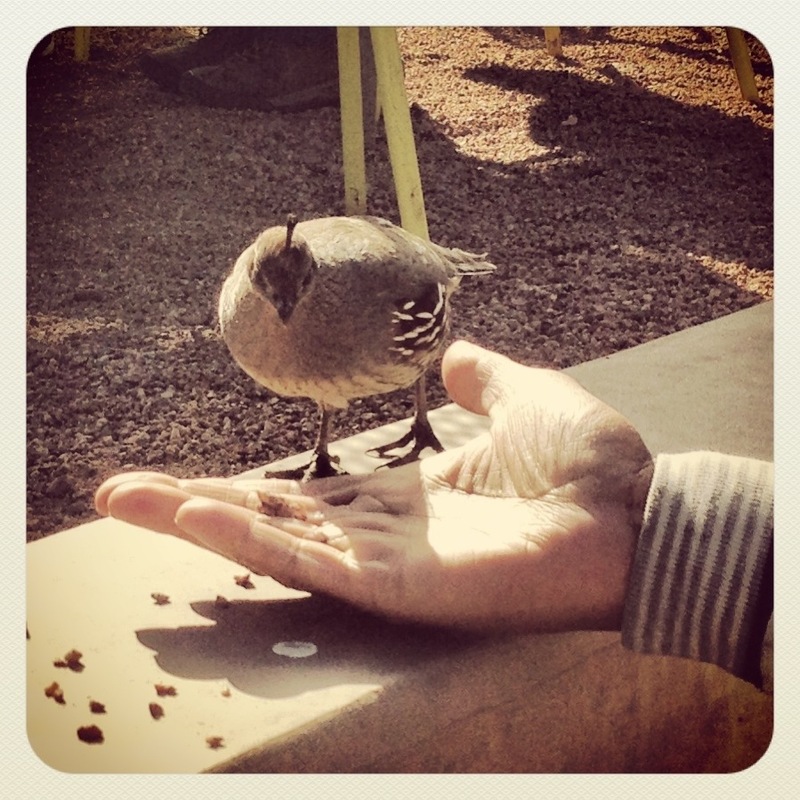 We met a friend there and also had a nice lunch in the patio cafe where the quail were so tame they came right up to us and practically ate out of our hands. 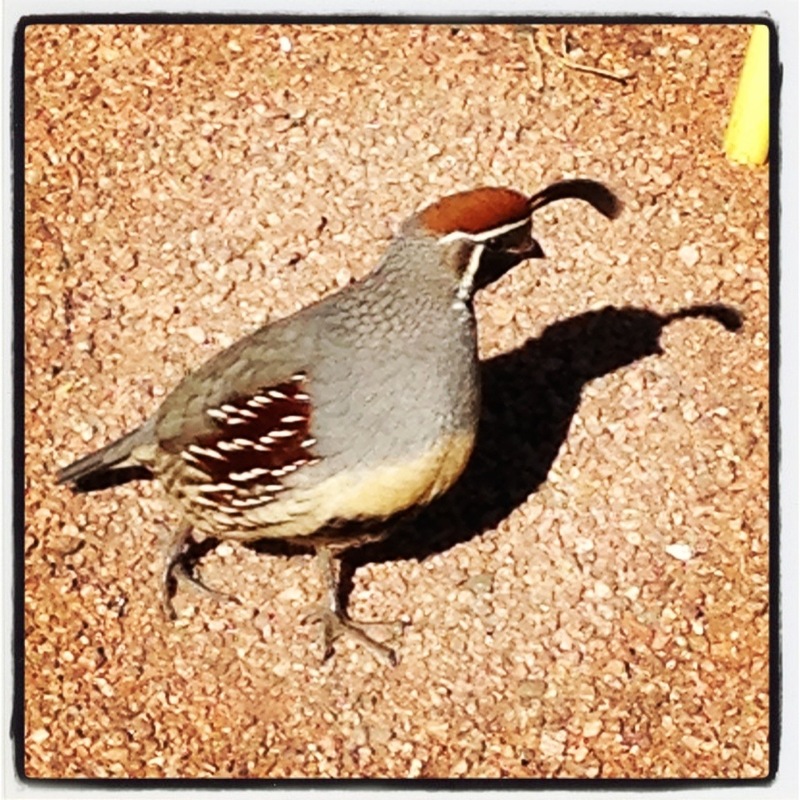 I have never seen so many quail in one place and NEVER so tame! There was also a lone squirrel in the mix that did, in fact, come up to me and take a piece of bread from my hand. He even posed for several photos! 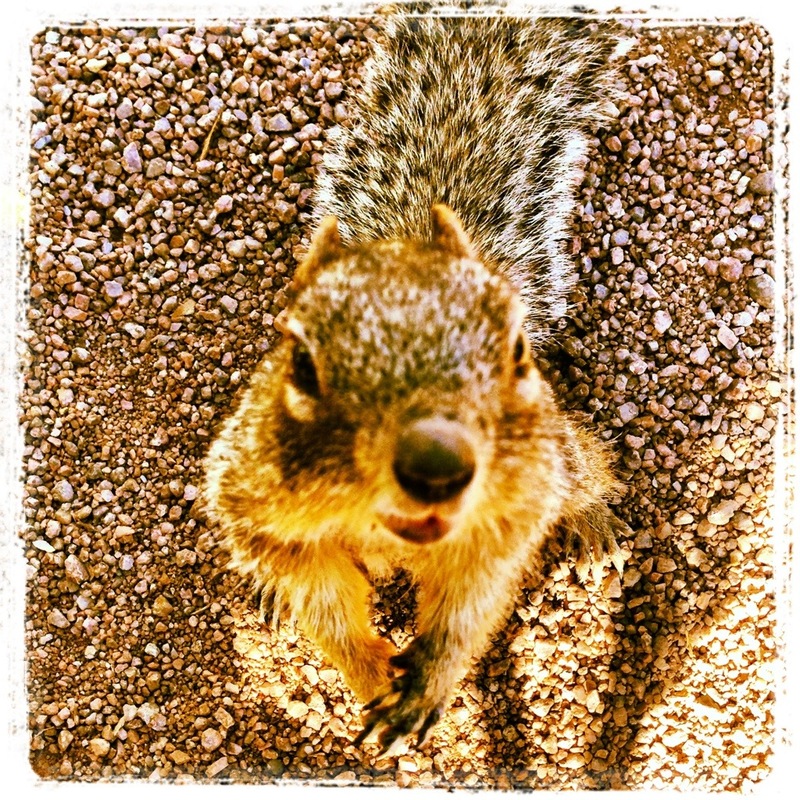 squirrel that ate out of my hands! Delectables was another lovely venue. It was a restaurant/bar and though the audience wasn’t there just for the music (we played for an art opening), they were friendly and welcoming. The owner, Donna, was sweet and invited us to come back anytime we were in Tucson. The third day, we were supposed to be on our way to Bisbee to play a show at the Grand Hotel Saloon, but our RV had other plans. 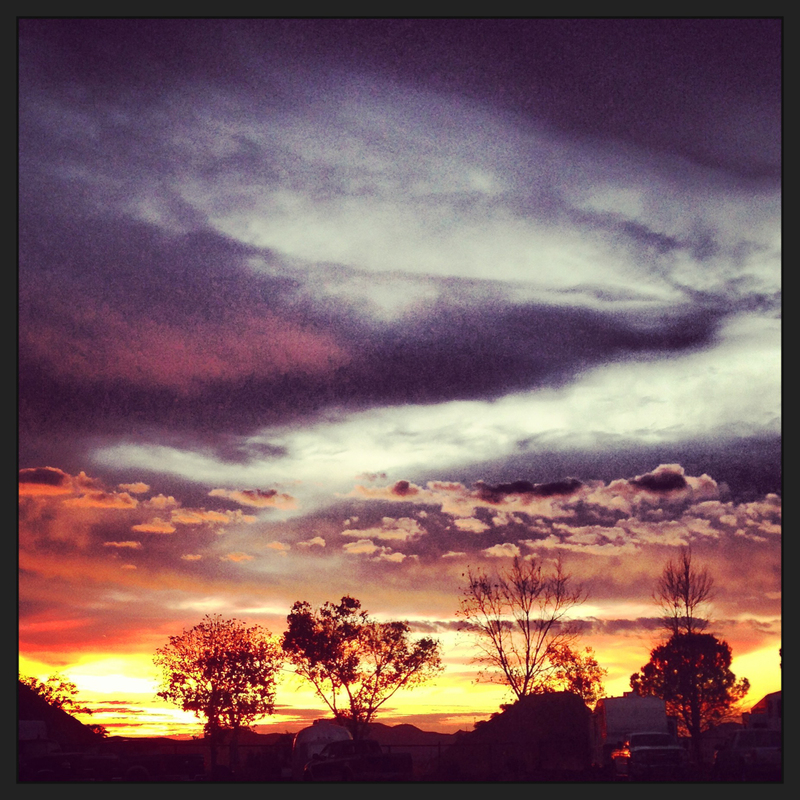 It started the night before on our way back to the RV park from our gig at Delectables. The night had gone really well, the crowd enjoyed our music and we enjoyed the crowd. That is, until we pulled onto the freeway and the RV started shaking and rocking back and forth. Aaron immediately pulled over because we thought we had blown out a tire. He got out, walked around to look at all the tires and got back in saying they were all still fine. So, we fired the engine back up and got back on the road and everything seemed fine. The next morning we headed back out on the road with the intention of making a couple of stops for a new air filter and dish soap before we hit the road towards Bisbee for our show at 4pm that afternoon. This time we were exiting the interstate when the shaking and rocking started. This was enough for us to stop in the parking lot in front of the auto parts store and check the tires and underside of the RV once again, this time in the light of day. There was evidence of something being off with the suspension, so we ended up calling the roadside assistance number for a tow truck. Incidentally, we had JUST purchased the roadside assistance before leaving on this trip. Thank goodness! Hooked up to the tow truck, finally, after a 3-4 hour wait! Long story short, after a 3-4 hour wait (it was a Sunday after all), we got towed to the mechanic’s yard and ended up spending the night there while waiting for our new tires to be ordered and delivered Monday morning. By Monday afternoon, we were back on the road thinking we had taken care of all the RV issues. We had already planned on going home that day anyway. To our dismay, we found ourselves stopped on the side of the road again, this time because we were losing power and backfiring. After some consultation with friends and family on facebook we bought some fuel cleaner and that seemed to help enough to get us to Las Cruces (halfway point) for the night. 1. Roadside assistance membership is a MUST! 2. Three dogs is way too much for a small motor home! Any motor home really, they need a yard to run in and I HATE cleaning up dog poop in those little plastic bags! Gross! 3. 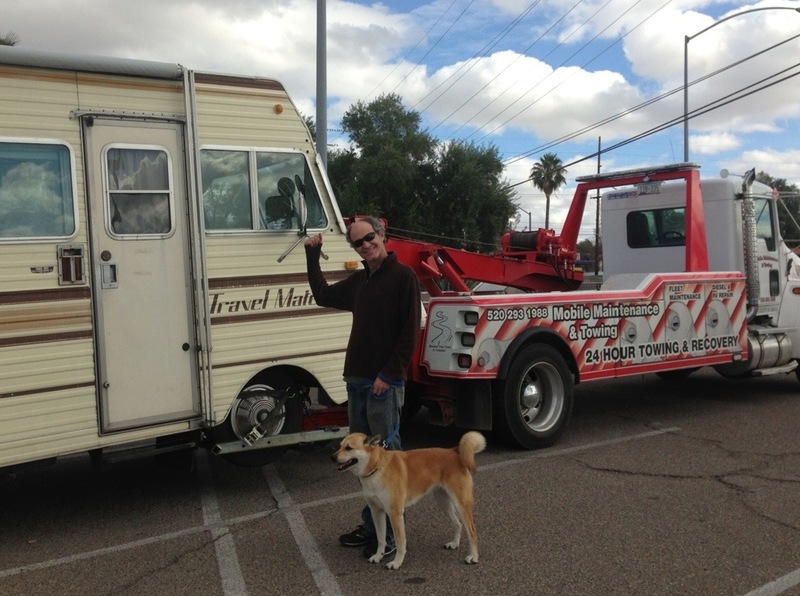 Towing a car behind your motor home may be a pain, but having a car when you get to your destination is priceless. Bikes are fine, but when you get a flat tire in a small town, you’re stuck with a flat tire until you get to a place that has a bike shop. Also, driving a motor home to a gig can be difficult when it comes time to find a parking space! 4. Though it is nice to travel around in a motor home and have your home always with you, it’s also nice to have a home to go back to when the trip is over. Since we rented out all the rooms in our house with plans to live full time in our RV, we had to sleep on our mattress on the floor of our living room when we got home last night because it was WAY too cold to sleep out in the RV! 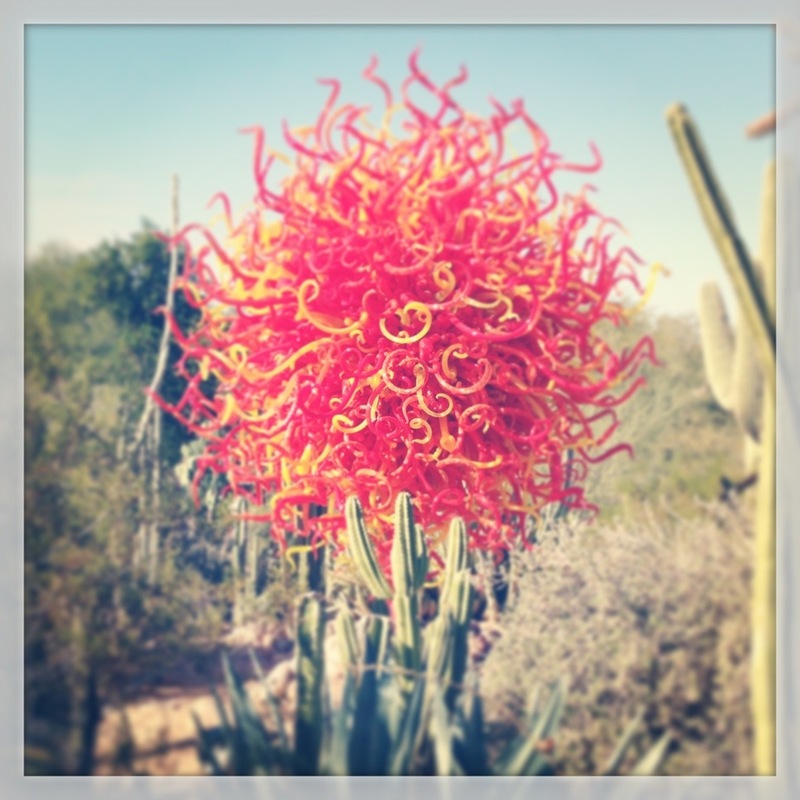 After the inspiring time spent at Chiricahua National Monument, we took a short drive over to Bisbee, Arizona. This small town is only a few miles away from the Mexican border. 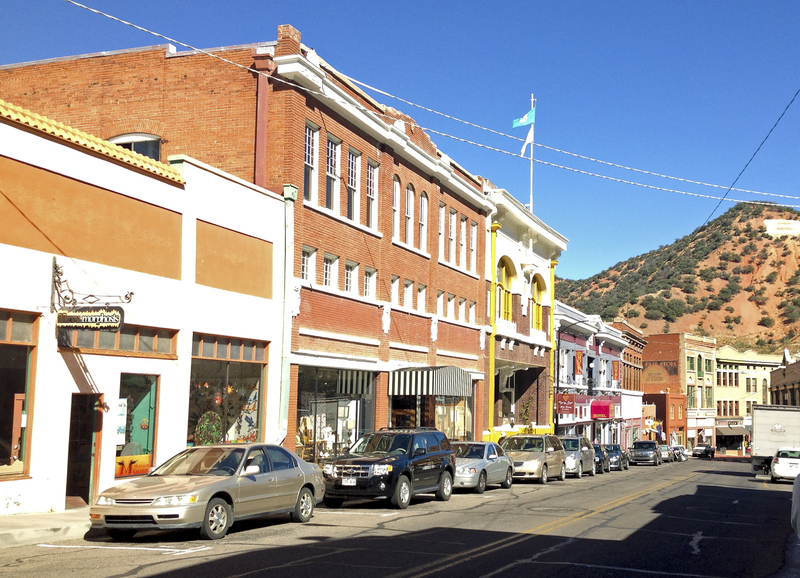 Bisbee was once the largest mining town between St. Louis and San Francisco! In it’s heyday the town had over 25,000 inhabitants. 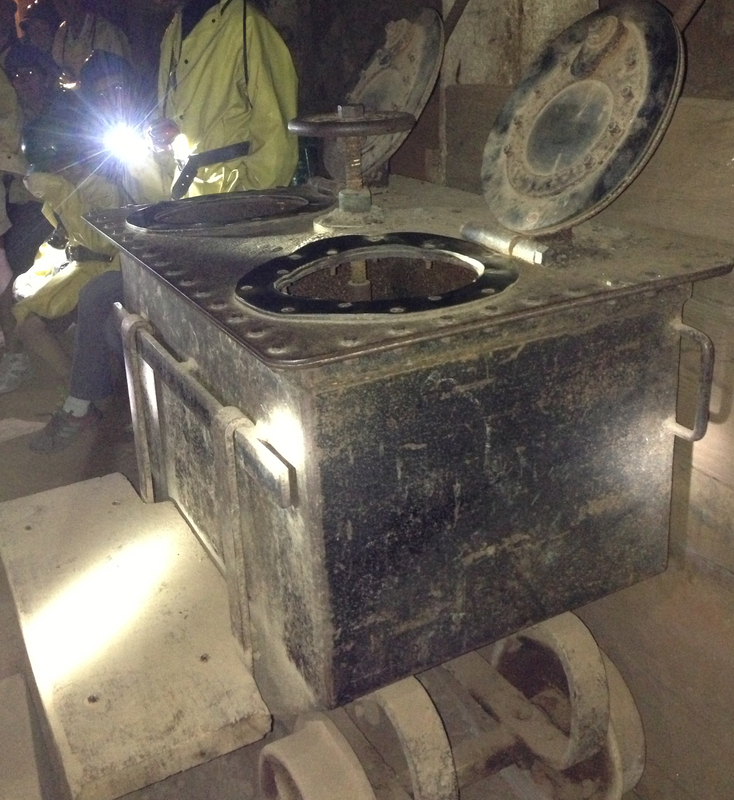 I forget the exact number but I believe there was 30 billion pounds of copper mined out of the hills and underground tunnels beneath Bisbee. The elevation is 5,300 feet so even though it’s located in southern Arizona, it wasn’t quite as warm as other southern towns in the state. In fact, after only a few days, a cold front blew in and we had wind, a bit of rain and lots of clouds. 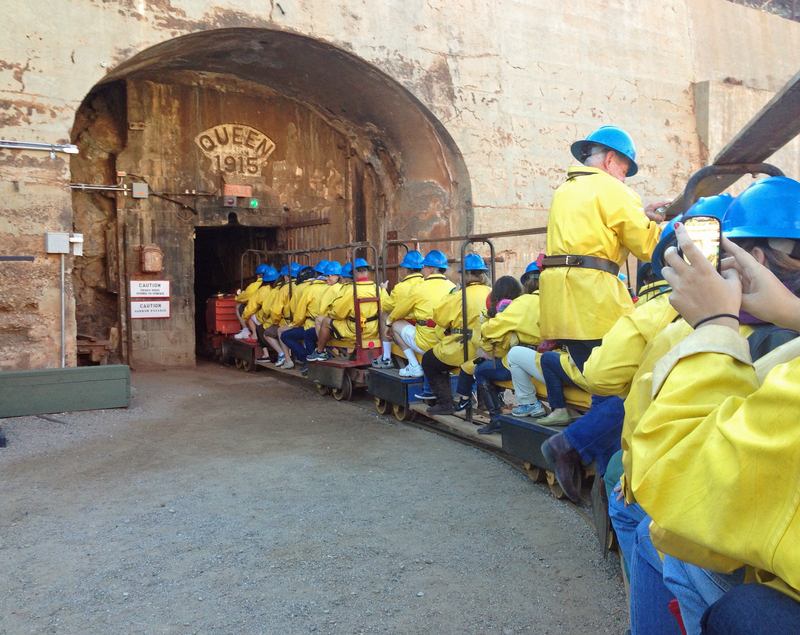 We took a tour of the Queen Mine which just happened to be just down the hill from the Queen Mine RV Park. 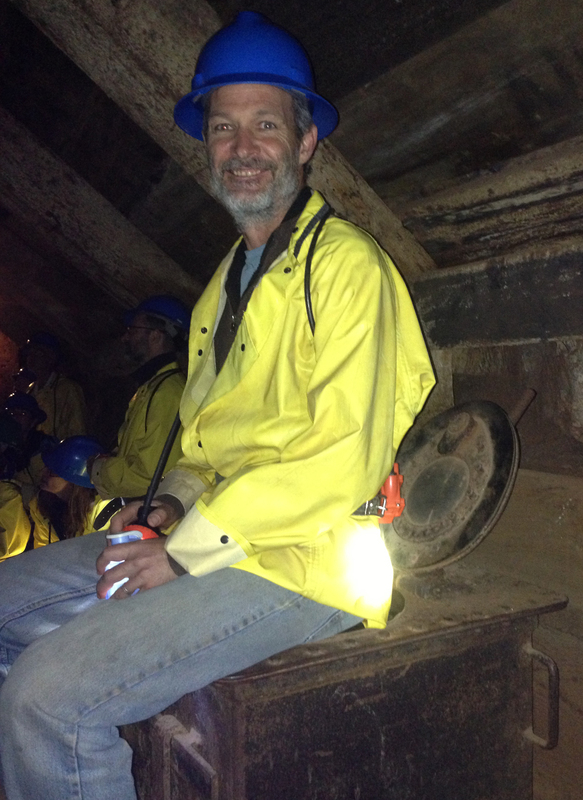 It was an interesting and educational tour, even if it was a bit freaky being underground in the man made tunnels. We stayed for a week and had plenty of time to explore around the town. 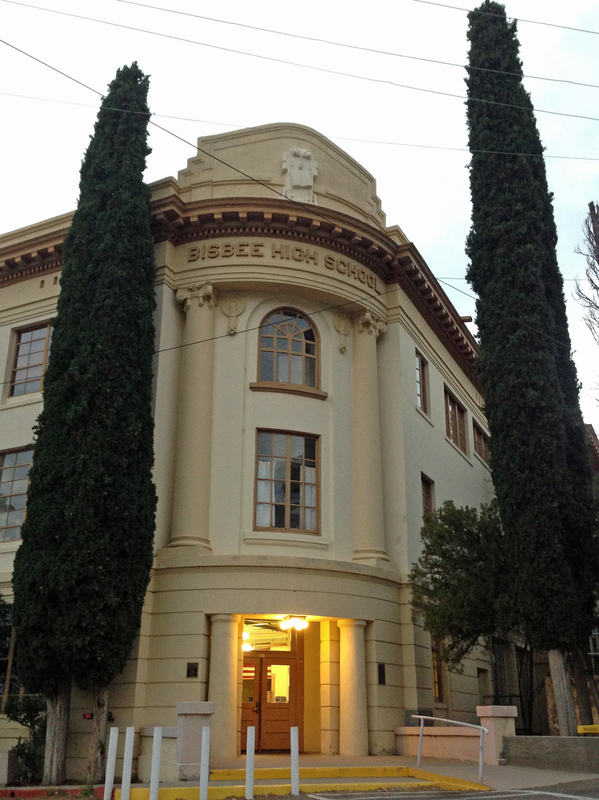 Bisbee has some interesting architecture. It was quite a wealthy town when built back at the end of the 19th century. Boss’ quadricycle. 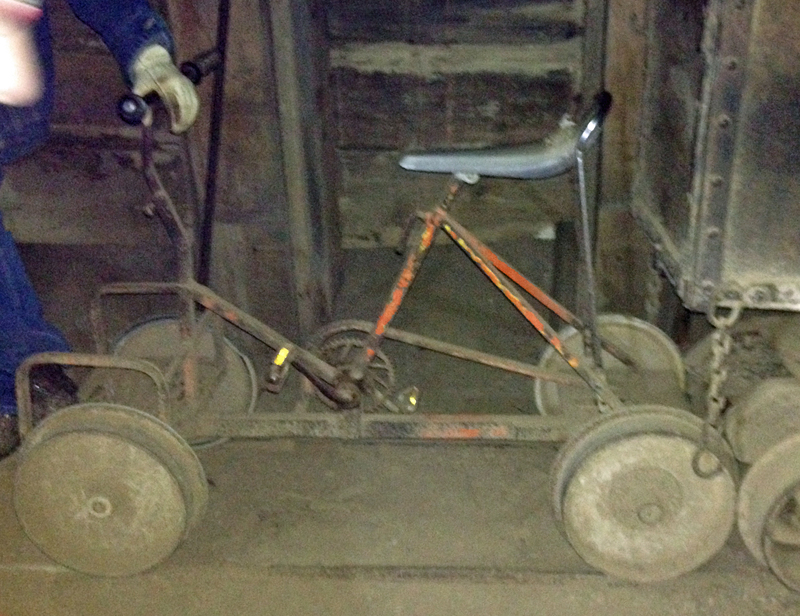 This was how the mine foreman got around in the mine’s 2,500 miles of tunnels! I located a gallery, 55 Main Gallery, that is now representing my art prints. I once sold my Paula Beck prints in the same space! I didn’t realize it was the same place until showing Aaron around the gallery. I found one of my old print racks, designed and custom built by myself with my stepdad’s help back in the early 1990s.The gallery had since been sold to a new owner, but apparently, the print rack came with the space and is still being used to display prints! 55 Main gallery has been in that location for 20 years now. My how the time flies by! 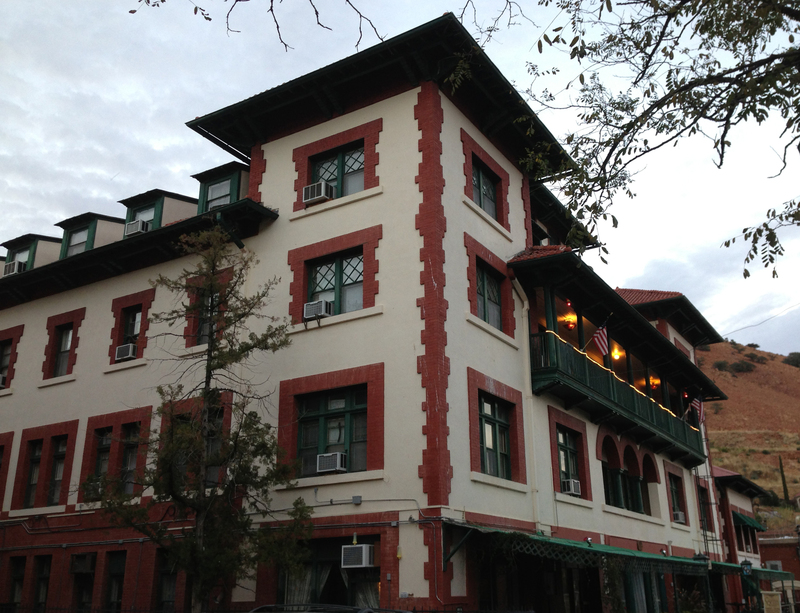 The Copper Queen hotel is at least a hundred years old and possibly haunted. We ate lunch at the restaurant there and enjoyed some live music in the saloon. We got plenty of exercise while we were there as the town is made up of nothing but hills and stairs! Unfortunately, my bike tire popped while we were in the Chiricahuas and there is no bike shop in Bisbee. So, we walked everywhere and road the town bus a couple of times in order to get our groceries from the only store about 5 miles away from the RV park we stayed in. 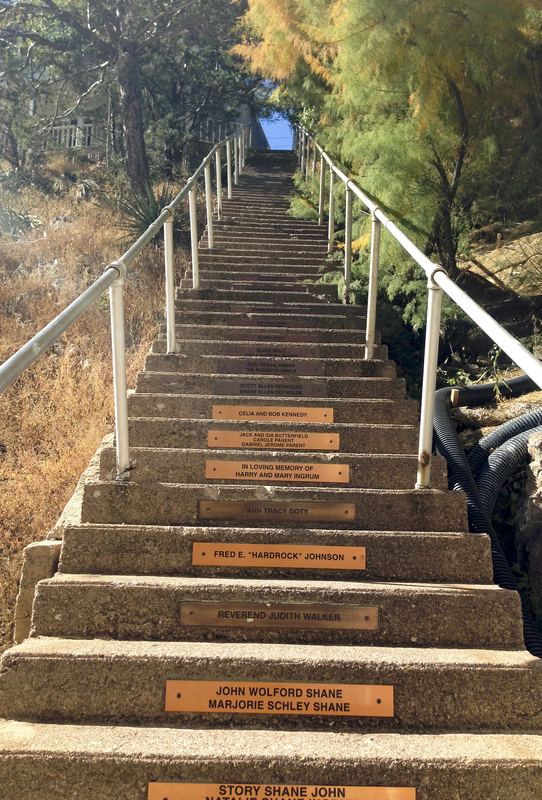 Bisbee is famous for it’s stairs! They even have a race called the 1000 stairs race. Since I was sixteen, my mantra has been “no regrets”. In other words, when I near the end of my life I want to be able to say that I have no regrets for the way I lived. When I was 16 a friend of mine died in a mountain climbing accident. At the time I had recently given birth to my first son. I was still in high school. That was my first wake up call. Life is short! I HAD to live it to it’s fullest! What if I died tomorrow? I had a few years of floundering around, married the father of my son, joined the military, had a couple more sons, and started my first art business. 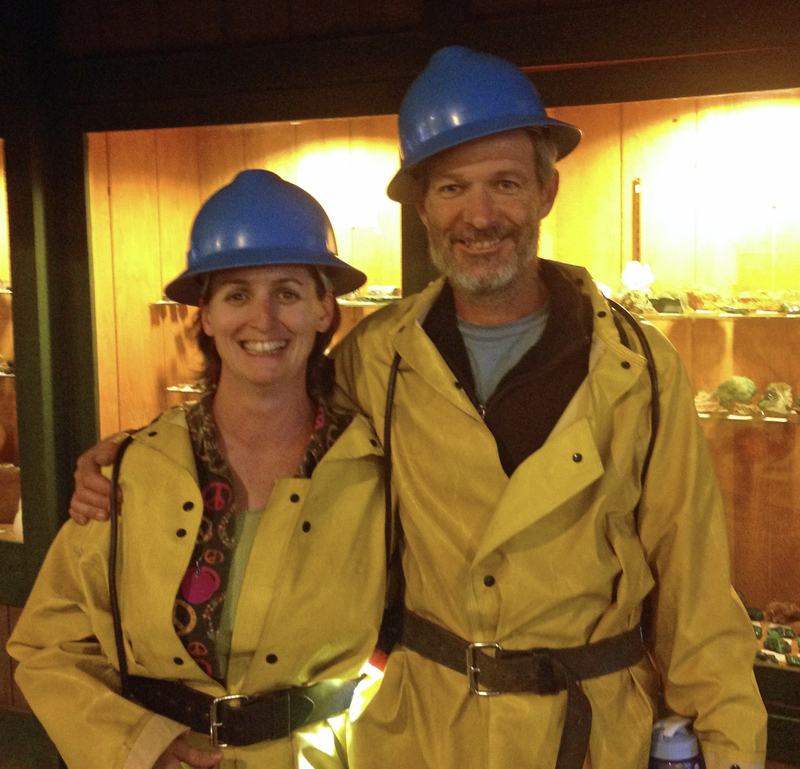 Not long after my divorce from the father of my sons, I discovered that I was in love with my best friend. We moved in together and married 1 1/2 years later. We had a lovely little family, my new husband was content to help me raise my boys since I could no longer have babies. Basically, I have lived and continue to live my happily ever after. Fast forward 15 years, my youngest son has moved out of the house and we now have an EMPTY nest! When I was young I sacrificed some of my dreams in order to be the best mom I could be. Always with the thought that we would have an empty nest around the time I was 42, leaving plenty of life left to live out those long forgotten dreams. For a few months, I have floundered around, yet again. Wondering what was next? I still love being an artist and have many plans and goals yet to achieve. Regrets? I still have none. My life isn’t over YET, after all. I’ve been revisiting some of the dreams I had way back when I was fifteen years old, before I became a young mother. One of them was to be a singer/performer/actress. It just so happens that I am married to not only my best friend, but a highly talented musician. We had tried to work together on a music project back at the beginning of our relationship. Before my husband earned his bachelors of music, before he had the patience and knowledge to help me find my voice. We had one gig back then. I SUCKED! I was so nervous, my voice never really came out, it just wavered and trembled and I was so embarrassed that I gave up on the dream. I went back to my art, my comfort zone. When dad died, it seemed perfect that we would put together an act in remembrance of him. So, for the last 4 1/2 years we’ve done nothing but talk about it. We always sing songs around the campfire when we take our yearly “memorial dad” camping trip. This year, finally, now that we have so much extra time on our hands, Aaron and I started practicing folk songs together. We told my brother about it and now we are working on putting our folk trio together. We spent 4 evenings in July practicing before, during and after our yearly camping trip. We have practiced since then separately, and together (via recordings and email). Tonight’s the Night! One Year of Chroma Studios! Tonight is not just another First Friday here in Albuquerque, tonight is the night we celebrate our one year anniversary in business at Chroma Studios! I can hardly believe it’s already been a year. A celebration it will be, lots of art, jewelry, live music, a poetry reading, refreshments, open studios, artists to meet and fun to be had by all! Plenty of FREE parking too! 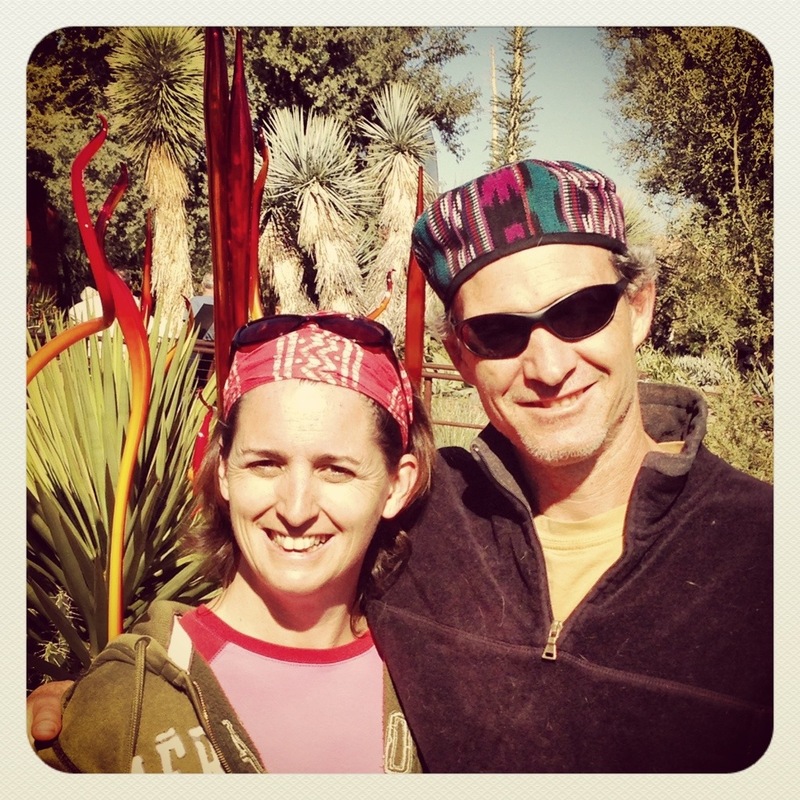 Featured artists are Paula Manning-Lewis, co-owner and founder and Chris Schelling, studio artist. Our upstairs studios will be open with artists here to share what they do. Carlos Contreras and Colin Hazelbaker will be entertaining upstairs with poetry readings, Aaron Lewis will be in his studio upstairs playing classical guitar, Jazz group, Duende, and bluegrass/blues group, Bleaker Street Boys will be out in the courtyard entertaining us with their music. Hours are 6 – 10 pm, hope to see you here!